James Norton started building motorcycles back in 1898. This was several years before Wilbur and Orville did their thing with the wings at Kitty Hawk. While those gentlemen were concerned about lift, Mr. Norton was much more interested in confining his flying about the roads and race tracks of England, and later, Europe. A 633cc four cylinder, side-valve single appeared in 1908. In 1923, just one year after Norton introduced an OHV engine; one of his motorcycles set the one hour world record with an average of 82.67 mph and a flying kilometer record of 89.22. A "works" racing team was formed the next year. The name Norton became associated with not just speed but also superb handling in both international racing competition and everyday riding. Finally, after 31 years of successful competition, Norton withdrew from works racing, their big singles victim of the new multiple cylinder machines. Victor of 34 Tourist Trophy events and hundreds of Grands Prix, theirs was indeed an enviable record. 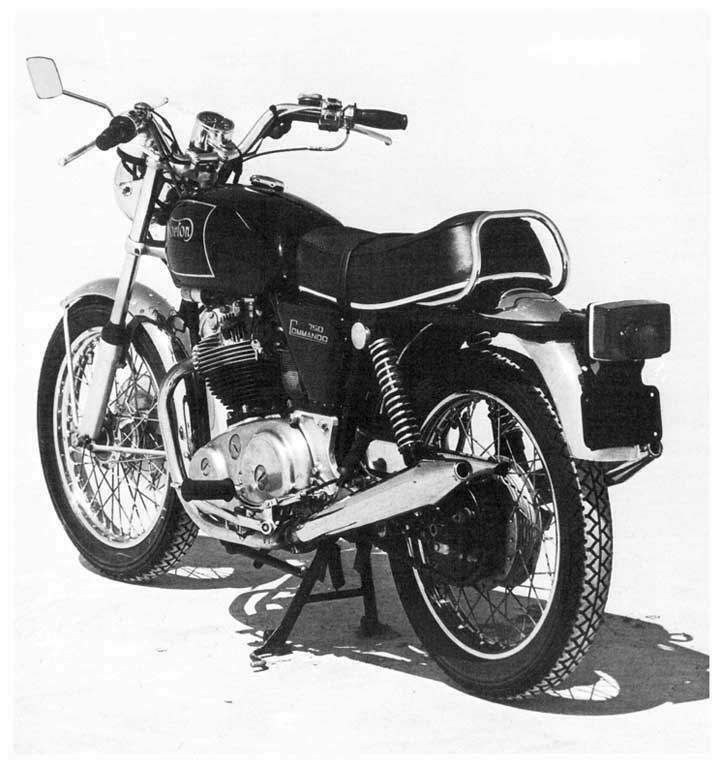 The Manx production model, namesake of their most famous racer, was terminated in 1963. Six years later the rejuvenated Norton Villiers introduced the Commando, a 750 twin. It is indeed a fitting appellative because the motorcycle is worthy of commanding the attention of highspeed roadability enthusiasts everywhere. The thing the Norton Commando Roadster does best is handle. We rated it just a notch behind the Trident in this department, and it was no easy decision. This English lightweight scales 425 pounds fully fueled. It is the lightest of the seven by 30 pounds. The Kawasaki was second lightest. The Commando leaned over into the corners with no conscious effort and could be laid over as far as the rider's prudence and fortitude in face of certain laws of physics permitted. We couldn't drag anything. The stands are so much up out of the way that it requires a nimble foot to find the side stand—a slight inconvenience well worth the contentment fostered by the absence of sparks midst grating steel. It handled all phases of the high speed roadability test with flying colors. The Norton was stable under acceleration and kept on tracking straight on its line. The riding position was comfortable for the hard circuit laps, and we didn't notice any change after picking up a passenger. We feel that the front binder is superb for high speed performance requirements. It has so much potential that during panic stop testing it had to be applied with restraint to prevent the involuntary departure of the rider from his mount. The control lever is quite sensitive and response is very positive. Minimal pressure is required to initiate full braking force—would you believe two fingers in a panic stop? The back brake is okay and didn't bounce or hop around when tossing out the anchor. Stopping in the shortest possible distance introduces an entirely different behavior pattern than that experienced getting around corners at high speeds. As we mentioned, the Norton had too much braking power to just indiscriminately pull the lever. It was the only bike tested in which the tendency of the rear to come around toward the front under maximum braking could be considered "hairy." For stops from 65 mph the Norton finished fourth behind the binder champion, Honda, the surprising Yamaha, because it was an unknown quantity, and a surprising Kawasaki, because of prior experiences. It was the most difficult bike to control because of the great amount of braking power available to this, the lightest of the super-bikes. We also feel that chassis movement, possibly traceable to aging of the isolastic rubber mountings, contributes to this less than confidence inspiring performance. Both front and rear suspension are good, which is what you would kind of expect for a bike rated as a top notch handler. Most people generally acquainted with the Norton know about their isolastic construction designed to eliminate vibration. Well, it certainly does. We couldn't detect any noticeable vibration, and the Commando passed the rear view mirror exam with an A plus. There was no problem purviewing the activities behind while cruising at freeway speeds. Multiple images may be nice at photo shows but are a definite downer when checking traffic. Messrs. Beaur, Hooper and Trigg really got it together, as they say, only literally. They split the bike into two separate units and then brought it together insulating strategic junctures with heavy resilient rubber washers. By joining the engine, transmission, rear wheel and swinging arm into one unit, there is no vibration to go throbbing through the frame. This system also means that the rear wheel and countershaft sprockets are always lined up perfectly. At idle the Commando pulses and throbs like a leashed beast eager to spring. A twist of the easy tensioned throttle and the instant smooth power response yields forward thrust, and all those throbs vanish into go power. We did detect a minimal amount of footpeg vibration at high speeds, but it is hardly worth mentioning. The vibration free ride does have one drawback, however. The isolastic system producing it depends upon the resiliency of the rubber mountings. As mentioned before, chassis wiggle, probably traceable to worn rubber, does appear during white-eyeball stopping situations. The Norton offers a four speed gearbox with a very good ratio spread. All other bikes tested, with the exception of the Sportster, feature the five speed box. We never noticed any clunking type noises during shifting. Fairly light pressure is necessary when pulling in on the clutch lever. The clutch engages quite quickly upon initial releasing movement but is controllable. We did notice a fair amount of travel in the shift lever, but operation was decidedly smooth. The Norton's performance in acceleration testing confirmed our impression of its wide range pulling power capacity. We feel that a five speeder has the decided edge. in such maximum testing, and yet the British twin notched a 12.92 quarter e.t. It finished second, .26 off the best time of the Kawasaki Mach IV. Quarter mile speed was 103.21 through the traps. We just wound it up and dropped the hammer and tracked off down the asphalt. There was a slight amount of breaking loose getting under way, but nothing we couldn't handle. The motorcycle didn't indicate any inclination to rear up on us. We shifted at about seven grand. During high speed lap runs we felt the power coming on strong from 3000 up. Norton is to be commended for the accuracy of their speedometer. We tested accuracy at both 60 and 80 miles per hour. The speedo was consistently optimistic but by less than one mph at either speed. At 60 the percentage error was less than one and a half while at 80 mph it dropped to just over one percent. The Harley edged out the Norton by six one hundreds of a percentage point for speedo accuracy at 60 mph but was out of the ball park upon increasing speed to 80. It read about six miles per hour under actual speed—almost an eight percent error. It is interesting to note that the Harley and the Trident were the only two bikes that went faster than their instrument indicated. We could detect no lag in tachometer performance. We did find it necessary to concentrate on instrument location as our left hand searched for the various light and turn signal controls. The tach and speedo are separated just enough to make it difficult to take in their respective information simultaneously. We would like to see a trip meter added. It's a handy little addition and can save the rider from those old empty gas tank blues. Norton still opts for kick starting although there are indications that space has been left to easily convert over to an electric starter on a future model. The cylinder case looks like it was designed to accommodate just such an item. We found it took about four good kicks to fire it up cold, with a warm-up time of approximately three minutes. One strenuous dab was all that was generally necessary when the engine was hot. When we tested the roadster several months ago we thought it was relatively quiet, at least for an English twin. We do have to revise that estimate now that we have had an opportunity to listen to the various mellifluous sounds (in most cases) of seven different machines in one day. Both engine and exhaust noise is on the loud side. The only bike with a higher decibel meter reading during testing was the Mach IV. We do feel that the current testing method used by the state of California may unwittingly and unintentionally discriminate against bikes that get on their power quickly. The meter is placed 50 feet from the path of the approaching bike which maintains a steady 30 mph in second gear until it reaches the right angle intersection of its path to the line of the meter, which is pointed toward the bike. The rider then twists it on, and the highest Db(A) reading registered during the first 100 feet of acceleration is recorded as the rating. This in a sense penalizes the bikes that get it on more quickly closer to the recording instrument. A bike that doesn't get on the pipe until it is further down the line could actually be "louder" at that moment. In any event the three top quarter milers were, in the same order, also the three loudest machines. The Trident, which was the third fastest off the line was the third loudest. 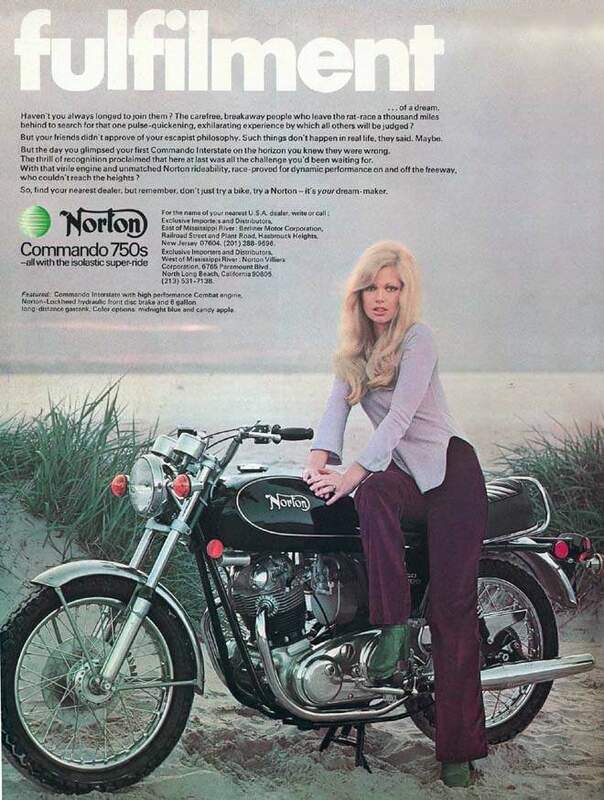 The Norton doesn't get our whole hearted endorsement in the comfort department. The basic positioning of rider contact points is good, but the seat may be a little bit too high. A shorter rider may have to concentrate on planting both pedals flat upon the ground. The foot pegs are fixed and may be a bit too high. The seat is a bit narrow, which can be fatiguing for the touring type rider. It's also a little too short to allow a passenger any selection about seating position. There is just enough room to sit on the back of the seat, which slopes forward, down into the rider. One nice thing about the seat is that it is adjustable. Not really, but it certainly provided one of the highlights (at least in the white eyeball department) of the day during acceleration runs. Our intrepid tester dropped the hammer, and he and the seat made like they were going to sit back and let the bike do the quarter by itself. The seat slid back a good foot, prompting a very hastened shut off. 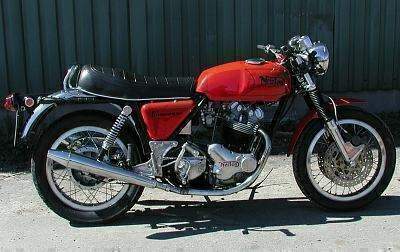 We realize this was a really freak happening, but all you Norton owners out there, check your saddles. As we mentioned in our previous report on the Commando, we were really impressed by the tool kit provided. A great deal of thought and consideration for the rider who likes to maintain his own machine is in evidence. It doesn't make the bike perform any better, unless of course you require emergency trouble-shooting, but it is a nice little gesture showing that the manufacturer does have some concern for what happens after all the papers have been shuffled about and signed. Our test bike came in basic black with the distinctive Norton logo in gold upon the gas tank. Gas capacity is 23/4 gallons, which is good for about 100 miles plus reserve. The traditional black paint job just lends enforcement to the overall impression of classic simplicity. We did have problems with the chain throwing oil on the back of the bike and passenger. We suggest clamping off the lubricant flowing from the oil tank. Manual attention to the lubrication needs of the chain make for a cleaner machine and passenger. We understand that Norton is working on a check valve to eliminate oil siphoned from the tank for the chain after shutting off the engine. Currently the result is a puddle of oil upon the ground. The Commando roadster is excellent execution of the purpose for which it was conceived and built. This lightweight, in pounds, is clearly heavyweight in performance. A quarter horse at the 1320 it becomes a thoroughbred over the distance. The heir of Manx does well in projecting the aura of time tested champions to the discriminating rider who prefers the sublime feel of an English handler.